Welcome to Drones & Quads.com. We have collected hundreds of cool hobby drones, camera drones and quadcopters for the UAV / unmanned aerial vehicle hobby enthusiast. Drones have become so More... affordable that anyone can own a drone. Strap a camera to your quadcopter and make beautiful aerial photos and video. Great gifts here for the drone hobbyist. This is a fun hobby remote control airplane from ParkZone. It comes with all you need to get in the air right from the box. 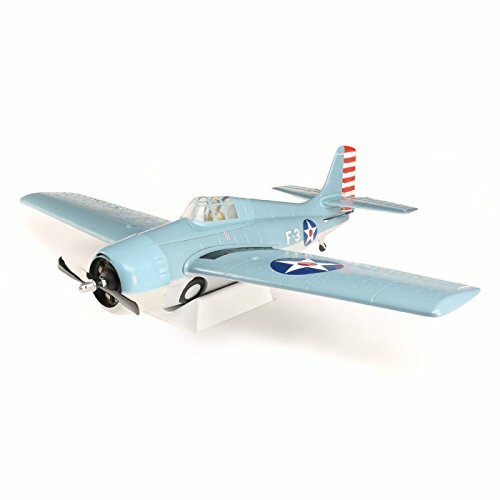 This remote control plane is modeled after the F4F Wildcat used in combat from Pearl Harbor through the following year. The model plane has an authentic look in its paint job and detailing. The remote control plane is loaded with extra features like SAFE mode for ease of use by newer pilots; artificial stabilization to aid flight in wind and turbulence; a high performance brushless motor system, and more. This fun affordable helicopter from Syma is easy to fly! It makes a great first remote control helicopter or flying vehicle for anyone interested in the hobby. 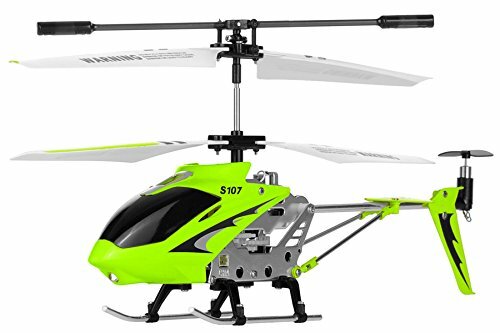 This green RC helicopter has a built-in gyroscope to aid stabillity and precision in flight control. Pilots have the ability to fly the helicopter up and down, backwards and forwards, left and right. With a fully charged battery you'll get 5-7 minutes of flying time. This is a super tiny mini quadcopter that's smaller than the palm of your hand! The little four-blade drone is easy to fly and is a great gift idea for kids. This little drone can pass through small openings and fly through objects and obstacles. It can be safely flown inside or outside and includes blade protectors in case of crashes. 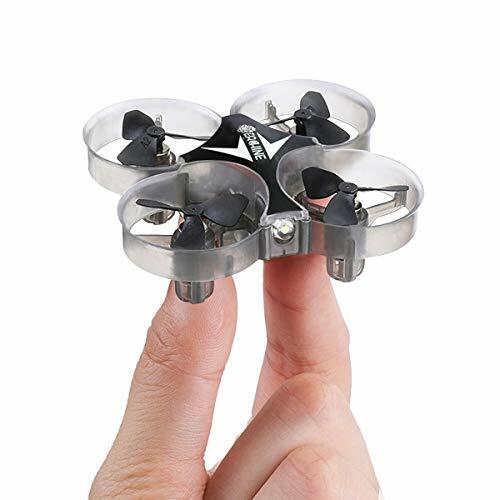 Although tiny, this drone has features you'd look for in a quadcopter of any size: 3D flip stunt capability; one-key return; headless mode; and more! This is a set of 8 replacement quadcopter drone propeller blades. The props glow in the dark! 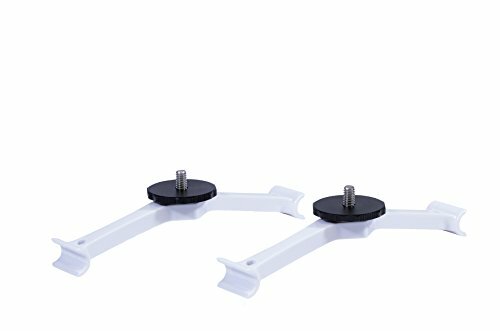 These replacement blades can be used for common 280- and 250-sized quadcopters. 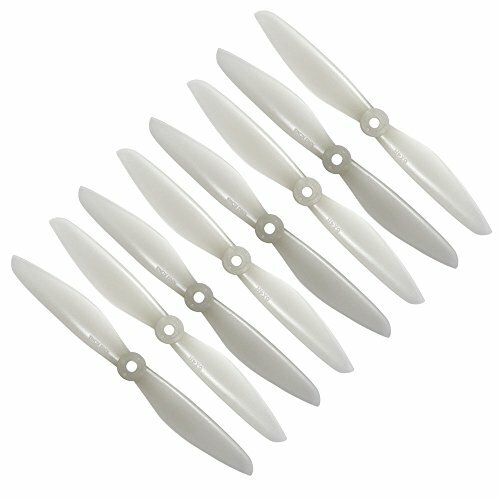 These are durable stiff plastic replacement propellers for common sized drones, including 280 and 250 sized units. These include the following models: QAV250; HK250; Walkera 250, FPV250; and more. Get these fun glow in the dark quad blades for your drone today! Add extra bright light to your DJI Phantom with these mounts for the extremely versatile Lume Cube (cubes not included). These lights have many uses, including photo lighting, inspection lighting, surveillance or search and rescue lighting, and more. Lume Cubes are extremely versatile cube lights that can be adjusted in 10% light intensity increments or be used to flash. The cubes can be controlled remotely so it is easy to make lighting adjustments while your drone is in the air. Get yourself some Lume Cubes and these Lume Cube drone mounts to add functionality to your quadcopter drone game!